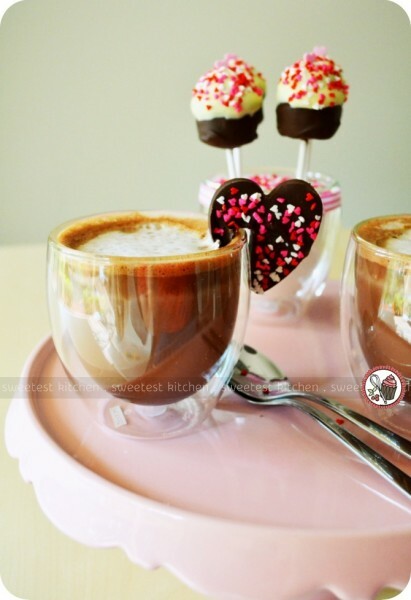 What better occasion to get back into the blogging spirit than Valentine’s Day! 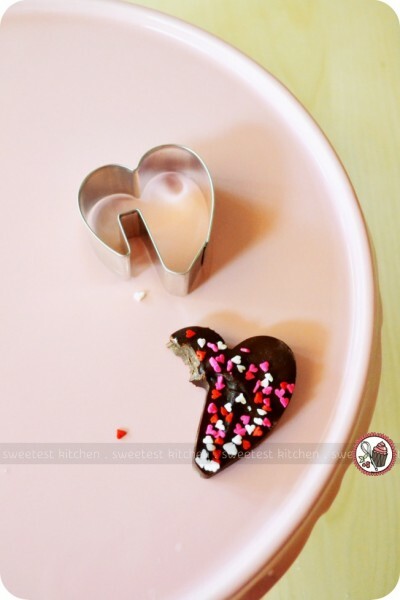 Kitchenware Direct has kindly sent me some more products to review and I decided to do a Valentine’s Day theme. On the menu is 2 Bodum Pavina double-wall glasses full of Belgian hot chocolate and topped with frothy milk straight from the Bodum Latte Milk Frother. Hanging on one of the glasses is a pure chocolate heart covered in mini heart sprinkles; this was made by using Baker’s Secret set of hanging cookie cutters (these are so neat!). 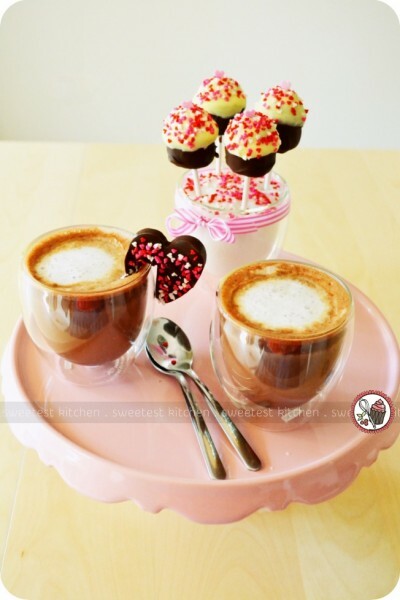 And to feature, again, these really gorgeous double-wall glasses, I filled one up with sugar and mini heart sprinkles to hold some homemade Tim Tam truffle cupcake pops. What a lovely Valentine’s Day treat!What a lovely Valentine’s Day treat! I’ll start off with the Baker’s Secret hanging cookie cutters. I really love these, it’s such a clever idea. Of course, you could bake cookies to hang on your coffee mug, but if you’re having hot chocolate you should have a block of chocolate hanging off your mug, right? This is what I really wanted to do with the hanging cookie cutters. I used the heart one (included in the 4-piece set is a flower, a star and a butterfly) for this particular purpose. I’ve never used a cookie cutter as a chocolate mold before, but yes, it can be done. Place the cookie cutter on a piece of parchment/baking paper (you should do this on a plate or baking tray). Melt the chocolate, then carefully pour it into cookie cutter. I didn’t fill the cookie cutter all the way up, just about 1/4 of the way. I then sprinkled mini hearts on top. Place the plate (or tray) with the cookie cutter and chocolate into the refrigerator until very firm. Then, ever so gently, push on the chocolate to get it to come out. Easy! Hang it onto your mug and you’ve got one fancy hot chocolate! And the glasses! How neat are these! These are Bodum Pavina double-wall 250ml glasses. They are the answer to my prayers, as I have been looking, for months, for a small-ish and stylish glass to serve drinks and pretty layered desserts in. The glasses are mouth-blown, which means that no two are exactly alike. They are perfect for both hot and cold beverages – they’ll keep your hot drinks hot and your cold drinks cold – and apparently they do not develop condensation on the outside (I have yet to test this)! On the Kitchenware Direct website, these glasses come with a few instructions – you can put them in a (non-crowded) dishwasher; if you are using ice, perhaps put the ice in after you pour your drink in; avoid using metal spoons as they may fracture the inner layer of glass. However, in the box, there are no such instructions to be found. I’m going to take the advice on the Kitchenware Direct website however, as these glasses feel so fragile and light. It looks like they’d be heavy, but they are nearly as light as a feather. You also won’t ever be finding these glasses in my dishwasher as they will always be lovingly washed by hand. …and my first ever Eton messes. Oh my goodness, these are so easy, so quick and so delicious! On the left, a morello cherry one and on the right a mango one…. Absolutely gorgeous! The recipe for these will be at the end of this post. Oh, my favorite one was the mango one. Finally, the Bodum Latte Milk Frother. I don’t own a coffee machine. My preferred way of making coffee is in a coffee press, but I don’t have any way to froth the milk. I’ve used milk frothers in the past and have generally been disappointed with all of them – the froth will start out lovely, but within minutes, it just disappears. Not like the coffee you get at the coffee shop, where the froth stays until you’ve finished the coffee and then you have to use a spoon to gather it up! I had high hopes for the Bodum frother, but alas, its froth also disappears within minutes. Tell me, am I really doing something tragically wrong when I froth milk? Or do I actually need a fancy coffee machine with one of these milk steaming attachment things to get the kind of froth I desire? That said, however, the Bodum milk frother does froth milk really, really well. You need 4 AA batteries to operate it (which is a bit much for a milk frother, don’t you think?). The instructions say to froth the milk for about 2 minutes for best results, which means you have to hold down the red button on top of the frother for 2 minutes. This button is hard to hold down for 2 minutes – you have to push really hard! When the frothing is done, you can remove the lid and place the glass beaker in the microwave to heat the milk up before adding it to your coffee. 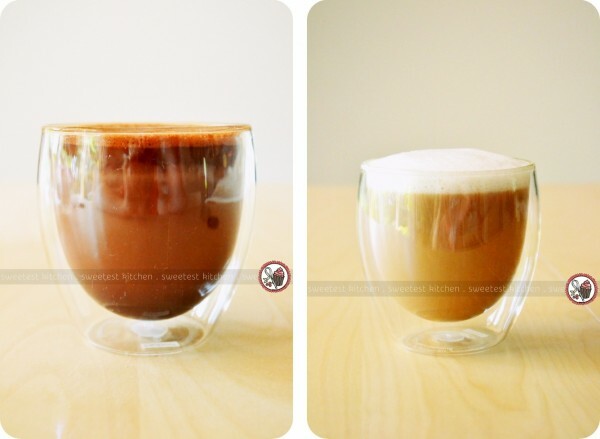 Tip – cold, semi-skim milk froths best! No matter what kind of frother you’re using – hand-operated, a wand or one of these Bodum ones. Even if you’re not using semi-skim milk, do make sure it’s refrigerator cold for best results. To show you how the Bodum Latte Milk Frother works, I thought it would be best to show you a video. The video is silent (otherwise you’d hear my 2-year-old screaming about something or other in the background) and I didn’t add music in case I annoyed anyone with my music selections. So don’t worry if you don’t hear sound – there is none! That’s the first video I’ve ever posted on my blog, hooray! In closing, about the milk frother, I’d say that while I will continue to use it, I probably wouldn’t recommend it, especially if you’re after the type of milk froth you’d get at a real coffee shop. The Bodum Pavina glasses? 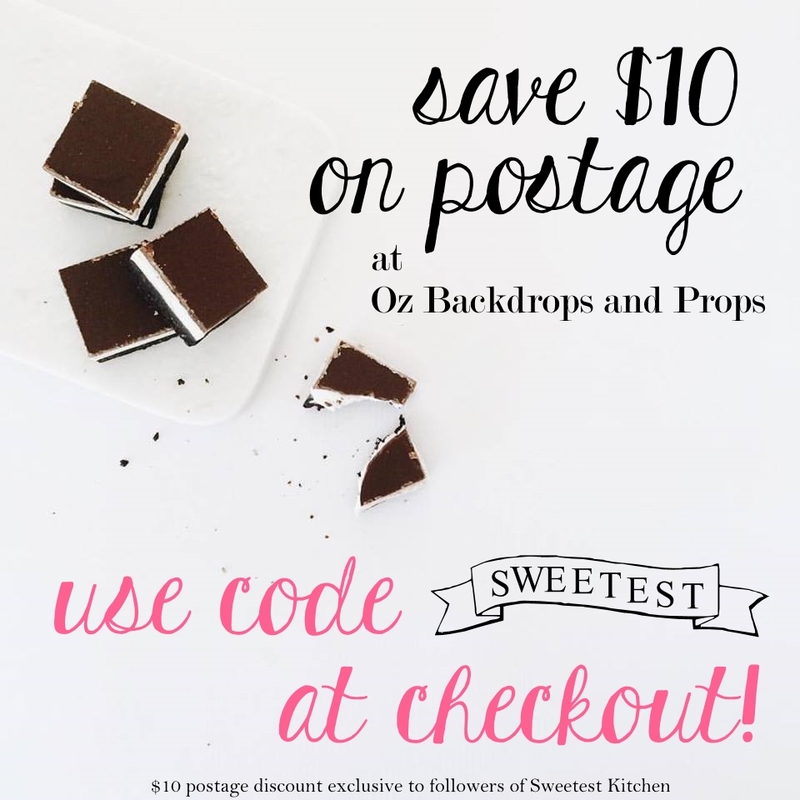 They are awesome and I’d totally recommend them to anyone, as well as the Baker’s Secret hanging cookie cutters. Imagine what else you could do with the cookie cutters besides using them as cookie cutters – use them as a chocolate mold for hanging on hot chocolate mugs, or cut out some fruit to hang on your iced tea or lemonade. Finally, for that Eton mess recipe. You’re going to love this, especially if you love ease, simplicity and deliciousness! This review is made possible by Brad from Kitcheware Direct. The easiest and quickest dessert you could ever make! Layers of lightly whipped cream, crushed meringues and fruit also make this the tastiest dessert you could ever make! Using an electric mixer, beat cream, sugar and vanilla until soft peaks form. 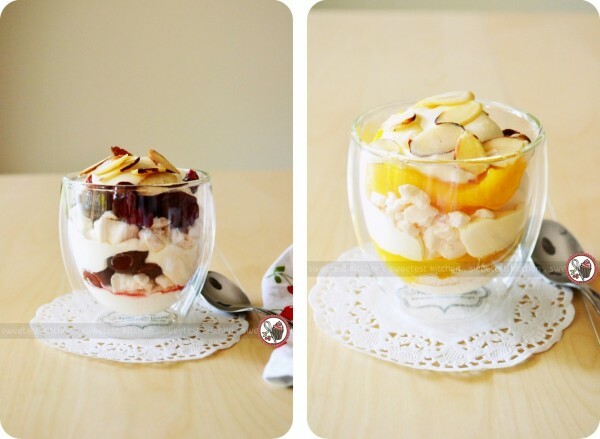 Layer cream, meringues and some cherries, or mangoes, in serving glasses. Top with a dollop of cream and a few flaked almonds. Serve immediately. There is contradicting advice all over the internets. I have used both low-fat and whole milk with the Bodum milk frother and haven’t noticed a difference! The only for-certain thing is that has to be cold. Forgot to mention, the instructions for the frother say that semi-skim milk works best. Oooooo I’ve actually been looking for some of those double walled glasses everywhere! They’re so… um… graceful I suppose. Very pretty. 🙂 I wonder if I could order from them in the US though? Bodum or not but I adore a good Eton Mess, ever since my neighbour, when I lived in Nottingham, force fed me some at a football party in 2010. I wasn’t keen on all that cream but I fell in love with it almost immediately!